Today we are pleased to tell you a little bit more about Nathália Nucci, a Brazilian volunteer who has offered us a vital contribution to our environmental department over the last two weeks. Nathália was kind enough to answer the questions below before getting the bus to Salvador, where she is gonna spend a few days before heading back to São Paulo. Thank you so much for all your work, dedication and commitment, Nathália! It was great working with you and we hope you have enjoyed your stay as much as we enjoyed having you with us! Hi, Nathália! We were so happy to have you with us for the last two weeks! Could you please tell us a little bit about yourself? Hi ETIV! I'm so grateful for the opportunity to be here for 2 weeks! I'm Nathália, from São Paulo state and I'm 23 years old. I'm graduated in Business Administration and currently work in São Paulo capital city. I'm a world travel lover who loves trying out new things like learning languages (I speak English, Spanish and Portuguese so far), photographing and when Itacaré, even Surfing and Yoga! Family, friends and my boyfriend are my top priorities and making the world a better place is an everyday ambition. I'm very passionate about people and I believe that education is the core of change, especially with kids as they are the future. I've volunteered in other moments of my life but never really deep dived in a community to truly understand, even if a little bit, the reality of their lives. That's why what motivates me to be a volunteer is the great opportunity to not only believe in education but actually act on it and, further more, get to know other realities in a deepest way that you may actually have a positive impact on someone's life. ETIV was a beautiful surprise for me! First, because I really wanted to volunteer in my own country, knowing that we have so many challenges to overcome. Second, because the core of ETIV, as mine, is believe in making change through awareness and education with kids. Sharing the same values, purpose and actually believing on the project is what really motivated me to come specifically to ETIV. Also, being in Itacaré is just an awesome plus for us Brazilians to get to live in one of the most beautiful places in Brazil and getting to know Bahia's rich culture. You were with us for almost two weeks. How was your experience? There are actually no words to describe the experience of volunteering in ETIV. Getting to know the kids, their reality, their issues and dreams and how their background impacts on their actions, is definitively the best gift you can have. 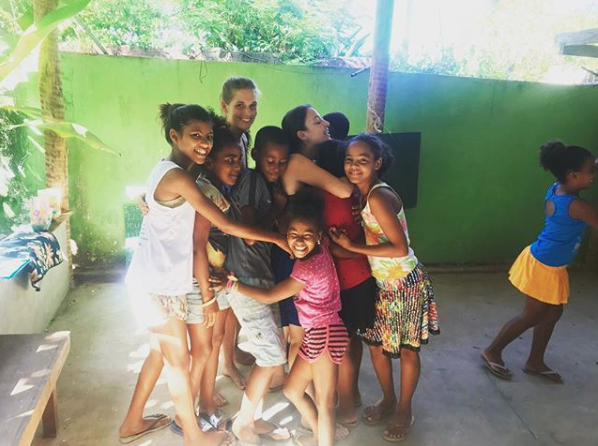 Also, I got to do good and learn from others and the community while getting to know so many amazing people (other volunteers, Bernardo, Alejandra and Jaci) and this beautiful place that is Itacaré is such a privilege. I'm grateful for being here and having this opportunity. What tips/advice/recommendation/suggestions would you give to someone considering ETIV for their volunteer experience? In your opinion, is it worth it to volunteer for a very short period such as one or two weeks? Being here for 2 weeks definitively proved to be worth it! Even if you have a short amount of time, if you come with the right mindset to really do things from the day 1 until the last day and focus on helping is much as you can, you will see that there's SO MUCH you can do even in a few weeks. Speaking of myself, for example, in only 2 weeks I supported the English Classes preparation and execution for 2 different levels, started a individual Portuguese Class, and worked with environmental initiatives such as: Supporting the planning of the first environmental training for teachers in the region, developed a curriculum for them to follow through the year and started to interview people from the community regarding their greatest concerns on the region for us to take into consideration for the Earth's Day Event. Greatest tips: Come with the right mindset (do your best starting on day 1), Get involved with the kids and their reality, Get to know this beautiful place as well and Do your best to make the other volunteers your friends and family. Do you want to volunteer with us but don't have so much time available? No problem! We can always tailor a volunteer placement specifically to your needs! Please check our current positions and Apply Now!